In this business you either sink or swim or you don't. Comments on: "David Smith Quotes: In this business you either sink or swim or you don't." David Smith was born in Decatur, Indiana. 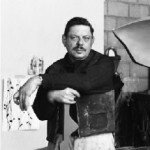 He was an American Abstract Expressionist sculptor and painter, best known for creating large steel abstract geometric sculptures. He studied art and poetry at George Washington University in Washington, D.C.. In 1964 he received a Creative Arts Award from Brandeis University.